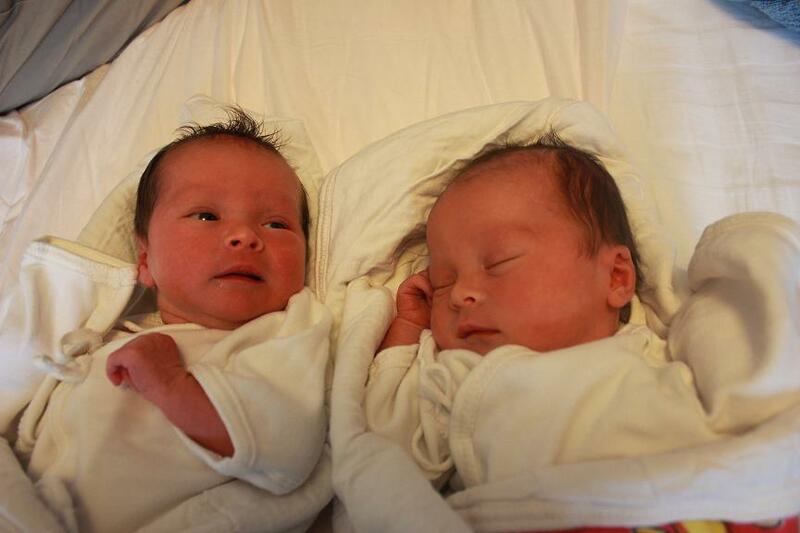 This Tuesday, January 29, at 6:45am, my wife Frances gave birth to twin baby girls. Alice Chovanec (Chinese name Cheng Yilan) was born first, weighed 2.82kg (6 lbs, 4 ounces), and was 46cm long. Rachel Chovanec (Chinese name Cheng Xinlan) came next, weighing 2.55kg (5 lbs, 10 ounces), and was 44cm long. Within hours, it became evident they have quite distinct personalities. Alice (pictured right) squints and grunts at the world around her, and cries loudly whenever she needs our attention — she also bears an unmistakable likeness to her older brother William (now 3 years old) as a newborn baby. Rachel (pictured left) hardly makes a sound, but is always opening her eyes and quietly looking around, just like she is doing in the photograph below. 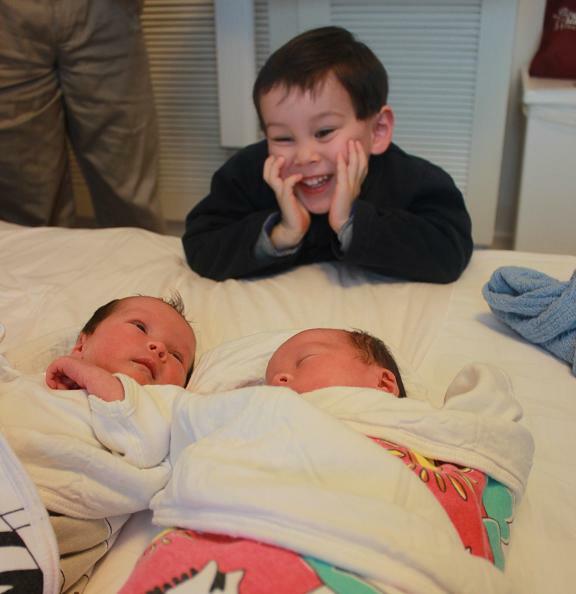 William, who until now has been enjoying life as an only child, got to meet his new sisters today and gave each of them a kiss — and then attempted to pinch Alice to see if she would cry. Actually, besides this one instance of rather innocent curiosity, William proved to be on his very best behavior, and — like all of us — is looking forward to getting to know these new members of our family much better in the days to come. Congratulations! Best wishes for a long, healthy, happy life with a wonderful family. Many many congratulations and best wishes ! Congratulations to you and Frances!!!! My sincere congratulations and all the best for the first few years which can be quite work-intensive! What a great gift of life ! Congrats ! Massive congratulations. You’ve got a noisy twenty years ahead of you! Fantastic! Enjoy the precious moments. You’re excused from blogging for a little while. Congratulations! Congraduations! i wonder if you have any plan for ur kids to move to other places given the air quality of Beijing. or that issue is just bought up in the foreign news. btw, how does the one child policy apply for non-chinese citizen living in China? presume your wife is a Chinese citizen? Congratulations, Patrick—you’re daughters are beautiful! And William seems quite pleased as well. Let us know when you are coming to Chicago. Perhaps we can arrange another dinner. Congrats to you, your wife, William and to the new sisters. Many years of happiness together. Patrick – firstly many congratulations to you and your wife. I hope both mother and twins are doing well. Congratulations Patrick. I know you only through your writing which I very much appreciate reading and your insights. I follow you under a couple of my Twitter handles. I spent 7 years travelling and doing business throughout China, your writing brings me back. Best wishes to and family. Bless you! Congratulations! I’m told the teenage years are brutal, but as a father of three girls myself, I can tell you that at least the younger years are a delight. How is the mom? Hope Frances is doing well! Great congratulations and hope everyone is well. I’m sure the pair will prompt some interesting blogs. Gorgeous family! Best wishes to their mama as well. I don’t know you, but have been reading your blog. Congratulations! Your children are beautiful! The twins look like angels. Congratulations on your beautiful growing family and on having the luck to have TWINS! Congratulations! May you and your family have cool breezes and calm seas. Wonderful news Patrick. Now you are more a person to me than you were as a Chinese commentator. May the tribe of the Chovanecs increase, may it prosper and become wiser. May God bless the twins and the parents. Congratulations. Hope you got plenty of sleep before they came! Twice as much to love but four times as much to do. Little stepping stones to heaven, as my Grandpa called them. Warmest congratulations! May they enjoy a peaceful yet exciting life, filled with love and many successes. What a beautiful family you have. Many congratulations. And now there are five, congratuatulations on the arrival of Alice and Rachel. Congrats Patrick. A good excuse to take a break from your excellent blogging! Congratulations. I got a little girl Saturday, name is Marie冬. William sure looks happy! Big brother now. Terrific family!! the most beautifull post i have see..is both like you (original)even your son. HOP LIFE BE BEAUTIFULL LIKE THIS PHOTO’S .. THANK YOU FOR SHARING WITH US ..
TAKE CARE YOUR FAMILY . They are all beautiful, congratulations Prof. and to your wife. I wish you luck and all the best for your family. These days, you’ve got all the blessing to have bigger family. The smart and genius type of genes are very important to the advancement of all man kind. Congrats and best wishes to both you and your wife. May the kids grow up healthy and wise in an open world. I see that you are now with Silvercrest Asset Management. Have you left Beijing for the cleaner air (sort of) of New York?